Looking at the stacks of plastic toy blocks and the ping-pong table-sized playing field, an observer to a FIRST Lego League competition might assume it's just a game, and the miniature Lego robot being carefully cradled in the hands of a middle-school aged competitor is just a toy. This would be mistake, at least if you happened to be observing Bedford's own Mindstorms Mayhem FIRST Lego team. The 10 Mayhem team members, ranging in age from 10 to 15, have taken this game to a level beyond simple competition, and have created something so much more than just a toy. After making quick work of the 48 best competitors New Hampshire had to offer, Team Mayhem, made up of area home-schoolers, headed to Atlanta over the April 15 weekend to represent New Hampshire against the world. Although they did not take first place in competition, Team Mayhem once again proved their mettle by capturing the coveted Director's Award. 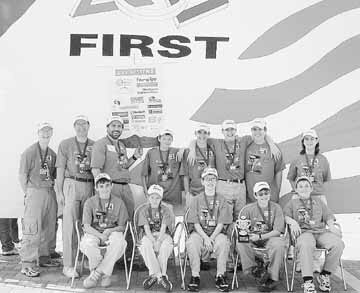 This award, which Team Mayhem also won at the state level, is given for the single team that shows general excellence in all categories ­ not just actual competition. The team did well in general competition, placing 13th out of 48 competitors ­ including five international teams ­ but according to Bedford resident and team coach Ken Streeter, the students were able to impress the judges outside the competition, as well. First, he explained, the judges were impressed with the transmission Team Mayhem installed in their robot. "The judges were impressed with how hard the kids had worked on building," he said. "They actually mentioned that the transmission had 'knocked their socks off.'" Streeter said the students also wowed the judges with a feature on their robot that allowed it to recognize its own battery level and adjust its performance as it began to die. In addition to proving a certain level of technological expertise, FIRST Lego League teams are also expected to develop and present a short creative skit. Streeter said the students shocked even their own coaches when it was Mindstorms Mayhem's time on stage. "They used a channel surfing skit, and the kids have never done it better than they did that day," Streeter said. "We kind of had our jaws hanging down on the ground at the back of the room watching." For their efforts, the Mindstorms Mayhem team won a $5,000 grant from Lego to help the team develop a FIRST high school team for team members as they graduate to the higher level. The FIRST Lego League competition is associated with the FIRST Robotics competition, founded by Bedford resident Dean Kamen in 1989. Kamen founded the competition in an effort to encourage problem solving skills and interest in technologies from a young age. The Lego League is for students ages 9 to 15. In both levels of competition, teams must construct a robot from a kit of parts, and then program it to accomplish a number of tasks. This year the Lego League had the theme of Mars exploration, and robots were required to traverse a Mars-scape littered with obstacles. The April 15 competition was held at the Georgia Dome in Atlanta. Forty-seven teams from 39 states and five foreign countries competed.